The Administrating Priest of the Catholic shrine of Our Lady of Madu in Mannaar, Rev Fr Emilianus Pillai, has expressed serious concerns over the deteriorating level of militarisation of Madu Junction area despite repeated complaints from the Madu Church to the SL President Maithiripala Sirisena over the past two years. The SL military has transformed the Madu Road Junction, an area with spiritual significance into an amusement and business site by operating a restaurant and conducting parties at the locality, the Catholic residents of the area have complained. Madu Road Junction is located on Mannaar - Mathavaachchi Road where the road to Madu Church branches off. The SL military is manning a check post at Madu Road Junction. There is also a mini camp with residences for Sinhala military officers. The Administrating Priest has complained to SL President in 2016 and in 2017 with the concerns of militarisation. SL President Maithiripala Sirisena replied to his letter with a promising response to control the military activity at the junction. Subsequently, the SL military maintained a low profile at the junction for some time until August 2017. However, the military activities have again increased at the junction, Catholic devotees complain. The Catholic people in Madu are also suspecting the Sinhala military for silently preparing to install a Buddha statue at the junction as there is an increasing trend of Sinhala Buddhist tourism being promoted from South towards Mannaar in recent months. 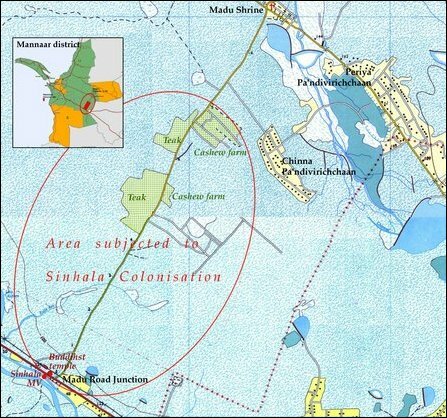 The previous regime of Mahinda Rajapaksa was openly promoting a Sinhala colony at the Madu Junction area.